Rent The Sanctuary on Penn | Corporate Events | Wedding Locations, Event Spaces and Party Venues. 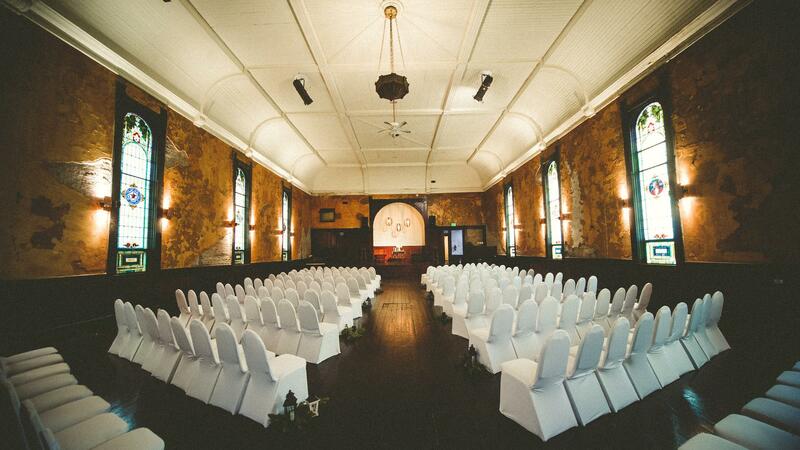 Inside of a church built in 1875, The Sanctuary on Penn has everything you need for both your ceremony and reception. A traditional and ornate exterior with an ancient Roman ruin design on the inside, our space is truly unique.Our venue was born out of a wish to give a bride and groom everything they desire. At The Sanctuary on Penn, we realize that your wedding is the most important day of your life. We've been in the wedding business for a long time, and its far too often that we hear a venue or a church say "no" when the answer should be "YES!" It's your day, not ours. It's your tastes, your wishes, your family, and your beliefs - there's no reason why you should have to compromise on anything. Be it parties, conferences, concerts, runway, professional, art, or a personal occasion of any kind, The Sanctuary on Penn is a great location for your next event. One thing that makes us so different is that we're FULL of ideas! So much more than just a space, we'll help as much or as little as you like with the smallest details of your event. Our staff has background in parties, music, fashion, summer camps, visual arts, teaching, and so much more. From 30 to 800 people, The Sanctuary on Penn can be tailored to meet crowds of all types and sizes.